Aria Handmade is an eclectic, artisan collection of high quality, handcrafted jewelry and accessories infused with recycled material from the US and natural, raw materials from the Amazon Rain Forest. Each piece is finely crafted by hand, making every product a unique and sustainable, eco-friendly design. 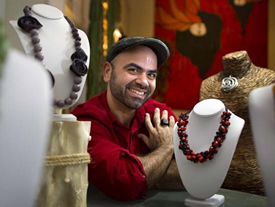 Nestor Pineda is the vessel behind the creation of Aria Handmade. His inspiration derives from his love of art, life and the joy of what nature brings. Nestor's collections primarly come from hand-harvested, nuts and seeds of South America, such as the ivory palm known as Tagua from Colombia, Bombono seeds from Peru, the Amazonian palm berry known as Acai; only to name a few... While obtaining these raw materials, his designs are also intergrated with recycled aluminum from Miami, fibers from North Carolina, and orange peel and melon seeds from the local Farmers Market. Production takes place at Nestor's studio in High Point, NC, with Nestor as the visionary in each design, and handcrafted by the help of friends and family he's trained to ensemble the pieces.